Objective: To sponsor one remote eye screening and cataract surgery eye clinic per year, conducted by the Tilganga Eye Centre based in Kathmandu. Outcomes: From 1990 to 2008, NAFA has funded 17 eye clinics either by full or co-sponsorship, a total cost of $60,000. Approximately 2,850 people have had their sight restored free of charge. 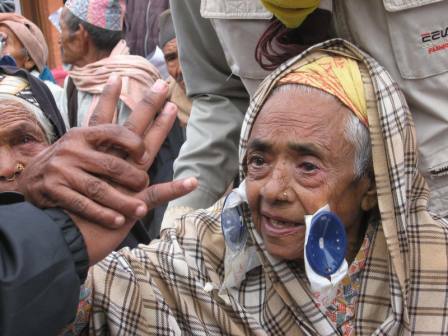 Details: The Tilganga Eye Centre provides opthamalogical services to Nepali people and operates an Intra Ocular Lens (IOL) labratory, for the manufacture of lenses for implants during cataract surgery. 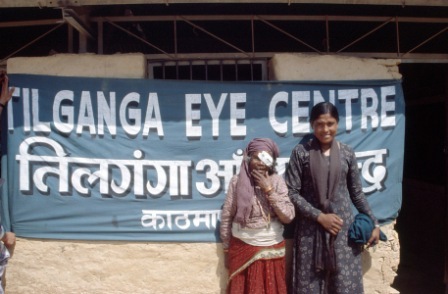 Tilganga Eye Centre conducts numerous remote area eye clinics free of charge in inaccessible areas where people generally do not have access to medical services. The remote area medical team members are volunteers and surgery and other eye care is provided free of charge. However, each remote clinic costs over $6,000 due to food provided to patients, transport, and medical equipment costs. Usually a school building is set up as a temporary ‘hospital’ and in most clinics over 1,000 people are screened; while 250 to 300 are operated on for removal of cataracts and replacement with lenses.